SUMMARY: Last week we discussed results of the MarketingSherpa Marketing Practices Survey, showing the most popular ways marketers entice customers to follow brands on social media platforms. This week we are examining consumer responses. Read on to discover the results of our consumer survey that show what motivates customers to follow brands’ social media accounts. In a previous Chart of the Week we looked at data from the MarketingSherpa Marketing Practices Survey on how marketers approach the challenge of attracting customers to follow brands on social media. This week we look at results of the MarketingSherpa Consumer Purchase Preference Survey to learn what actually motivates consumers to follow brands on social media. MarketingSherpa commissioned an online survey that was fielded August 20-24, 2015 with a representative sample of U.S. consumers. Overall, 85% of U.S. consumers said they used social media. Fifty-eight percent (1176 consumers) said they follow brands for any of the above reasons, while 26% said they do not follow brands on social media. 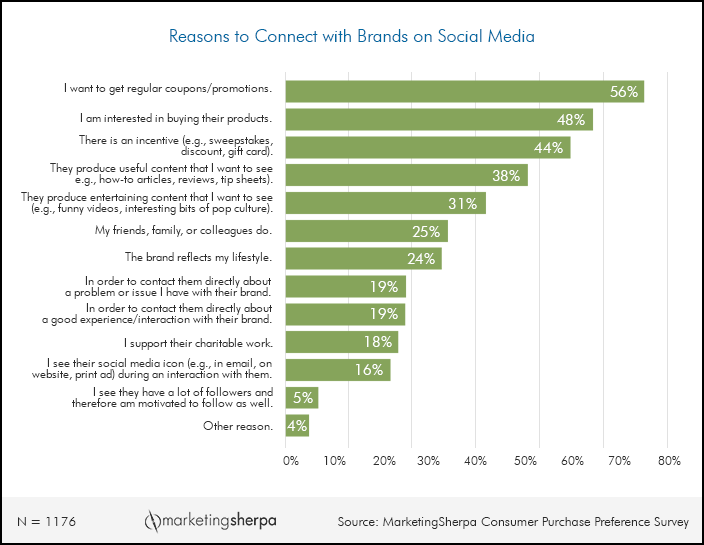 Perhaps it’s not surprising, but the most popular reason for those U.S. consumers who do connect with brands on social media was to get regular coupons/promotions (56%). Forty-eight percent of consumers said they connected to brands’ social accounts because they were interested in buying the brand’s products, and 44% said they connected because there was an incentive (e.g., sweepstakes, discount or gift card). Among the least popular reasons were seeing that a brand has a lot of followers (5%) and seeing their social media icon in email, on a website or in a print ad (16%). Less than half of consumers who follow brands on social media (38%) said they do it because of useful content (e.g., how-to articles, reviews, tip sheets), while the overwhelming majority of marketers (78%) surveyed in the MarketingSherpa Marketing Practices Survey said they attracted customers to follow their brands’ social media accounts by producing useful content (how-to articles, reviews, tip sheets). Another notable difference between customer preferences and marketer practices lies in the realm of CTAs. Only 16% of consumers who connected with brands said they did it because they saw the brand’s social media icon (e.g., in email, on website, print ad) during an interaction with the company. In contrast, more than half of the marketers surveyed (61%) made sure they prominently display social media icons in email, websites and print materials. This was the second most popular method among marketers to attract followers, after producing useful content. 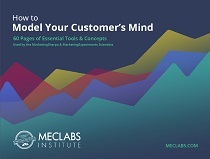 The data clearly shows differences between customer preferences and marketer practices. However, the gap may not be as wide as it seems. Marketers are observing and learning what customers want, although it may not be reflected in their current practices — several of our marketer survey respondents wrote they believe incentives are important to entice people to engage with brands’ social accounts, which is what the consumer survey confirmed. To wrap up, customers are motivated to follow brands on social media mainly by incentives, while marketers focus their efforts on producing useful content to attract followers. However, marketers are developing an understanding of their customers even if practices are lagging behind. That said, U.S. consumers are not a homogeneous group. What motivates younger people to follow brands on social media may not work for an older target group. Therefore, next week we will take a closer look at the consumer survey results to learn more about demographic differences in following brands on social media.